Ideas to design and build a Sensory garden. So what is a sensory garden? My sensory garden is a collection of plants, hard landscaping and garden materials and features I have selected and laid out in such a way to appeal to my own and my families senses. For me because I'm old and miserable I like to be able to sit and relax in a peaceful shaded place and listen to the birds and breeze in the trees, run my fingers over and feel the texture of the flagstones beneath my seat, doing nothing much at all. My wife on the other hand, who is a busy busy bee likes to relax by reading a book or fashion magazine in a sunny scented spot in our sensory garden and every few minutes is up and about picking raspberries or digging out weeds with a garden trowel - I planted bamboo to shield myself from her. However, our children (well grand children now) are not over interested in the serenity bit so I used pebble paths and some fun stuff like a chess board made from small coloured slabs to encourage them to play, explore, touch or taste, and interact with particular plants, features or objects. They seem particularly drawn to insects living under stones, so I built rockeries. The rockeries keep the kids busy looking under stones and my wife busy replacing the stones and replanting the plants. So a sensory garden can mean different things to different people. Some are designed to encourage activity and interaction and some to provide a place for peacefulness, to be alone with time to think, or preferably if you have the space designed and built with all of these things. This is what I think distinguishes a sensory garden from an ordinary garden. I think what really distinguishes a sensory garden from an ordinary garden environment is the inclusion of plants, materials features and objects with particular sensory qualities, used with the intention of stimulating our Senses, Seeing, Hearing, Smelling, Touching and Tasting. When you are designing your sensory garden you can also consider these sensations as well as the five senses. Gravity, temperature, space and enclosure to create a multi-sensory environment. Begin by asking the people who will use the garden what they want from the garden. Remember I said in the first bit of this article that I mostly wanted peace and quiet in shade, so I built a single wooden seat on a natural flagstone base under a tree with a bamboo plant to shield me from my busy bee wife. My wife wanted somewhere in the sun to sit and read and plant and weed and be in the open to be able to keep an eye what the kids were doing at the same time, so I found her a sunny open spot-at the other end of the garden-and planted a mix of scented and coloured sun loving plants and shrubs and placed a sun-lounger in the middle. Children might not always want to "just chill out and feel the wind and touch the leaves" so as well as plants we planned in some play materials and structures to encourage play and a patch of garden to grow their own. Big or small? Size really doesn't matter. A sensory garden can be everything from a window box to a huge area depending on how much space you have and can maintain (somebody has got to look after it). Even if you have loads of space starting small and allowing the garden to develop over time makes sense, when creating a sensory garden, especially if you have young kids whose needs and interests are likely to change over time. If you don't have much space or a garden even, you can still create a sensory experience by planting sensory plants in containers. No soft garden. A few years ago I designed and built a sensory garden for dementia patients living in a nursing home. The outside garden surface had been completely concreted over and was used for car-parking so no soil garden. So as not to take away parking space I suggested and quoted for a raised decking platform to run around the top of the ground floor accessed from the second floor where most of the patients lived. I then used pots and containers of different sizes and textures planted with all sorts of scented and tactile plants to create a sensory garden. The sensory experience was designed to start inside the hallway leading to the outside decking, by using plants (mostly herbs for their scent and size) placed in different rooms and on windowsills to create a sensory trail to the sensory garden. No garden? You can still create a sensory experience by planting scented and tactile plants in pots and containers of different sizes and textures on window-seals, against walls and on verandas. In fact, your choice of plants will be greater because all plants that thrive outdoors will do well indoors too, but in our climate not all houseplants can survive outside. Accessibility. Accessibility really does matter, especially if family or visitors use a wheelchair or have difficulty walking, more design tips for disabled people. Another consideration to provide further sensory stimulation, is to provide access for wildlife to get in and out of the garden. Choice of materials and features. Raised planters are a good idea, not only for the texture of the wood, but because it makes maintenance easier especially if bending is a problem. Trellis works, especially if you are short of space because you can grow climbers up it and trellis can also be used to divide the space up and create private/secret areas. Pebbles change colour when they get wet so are great for both touch and seeing sensory experiences. The choice of materials is endless and I have covered them in a bit more detail and linked them to sensory experience here. Whatever materials and features you use be they wind chimes, sculptures and upturned tin baths (which echo with rainfall) consider how they interact with the changing seasons. Seating and tables. 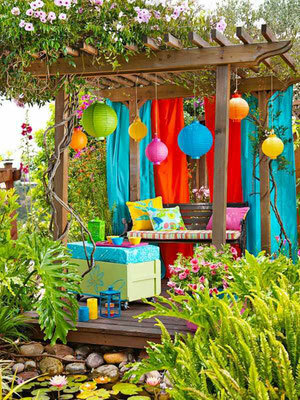 Not to much I can say here, style is over to you, but so important to have adequate seating and tables placed in shady and sunny areas, some for entertaining if you're that way inclined and definitely some positioned just to sit and stare. Shape of a sensory garden. There really isn't a preferred shape for a sensory garden, the shape is probably going to be mostly determined by what you already have anyway, but pathways, features like ponds, trellis dividers and flower borders can all be used to create your own preferred shape. It will also depend on your own and family needs, if none of you use a wheelchair or walking aid, you can have tighter corners and more slopes. If you have a long narrow garden try planning a bit of mystery into your design by hiding the bottom of the garden with trellis, fencing, bamboo or hedging and having a hidden entrance to one side. Sensations you can experience in a sensory garden. We actually experience more sensations than the five senses. Gravity, temperature, space and enclosure are some of them. Below I have listed some ideas that highlight the many different sensory experiences you can plan in when designing, planning, building and creating a Sensory garden at home. Plants and materials to include in sensory garden design that will stimulate the various senses. Looking and seeing òó. Plants offer a complete spectrum of colour and foliage, changing and providing interest throughout the seasons. Flowers, leaves, bark, berries, lichens and mosses all give the richness and changing colour essential in a Sensory garden. Bright colours, such as red and yellow, are cheery and stimulating to the eyes. They will add excitement and interest to the garden. For children, plants like zinnias, marigolds, red-hot pokers, blanket flowers, butterfly plants, and sunflowers add exciting colours and attract bees and butterflies to the garden. Hard landscaping provides colour as well as texture. Stone, old brick, gravel, slate any new or reclaimed materials can be used to create patterns of colour mosaics, murals, paving. The changes in appearance and colour of hard landscaping in rain and sunshine are interesting to the eye. ----Movement. Its key to include moving objects and plants into your design. Movement can be both stimulating and relaxing and can provide sight, movement and sound. Aspen, willow, ornamental grass, mobiles, chimes, animals, ponds, moving sculptures all provide movement. Some should be reachable so that people touch and move them. Place wind activated items in places likely to receive some breeze. Contrast: contrast in a sensory garden design is particularly valuable for partially sighted people. Hard surfaces, kerbs and edgings made from different textures and materials. Soft flowers and foliage contrasting with Hollies and berries, etc. Shape. 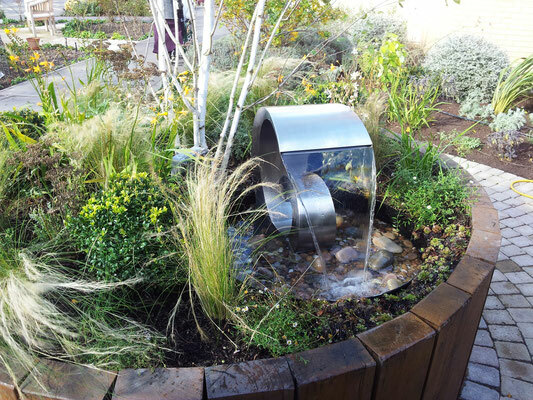 Most natural and artificial materials can be used in Sensory garden design plans. Some of the simple, distinctive shapes are best, like the bark and leaves of sycamore, beech, ash and the bonus of the experience of taste with fruits like apples, currants, rose hips. Flowers like daisy, poppy, bell flowers provide both shape and colour. Stems, bamboo canes, round, square, rectangular paving, seating and plant containers all add shape to a sensory garden. Shapes, circular flowers, cubic containers, oval fruits, triangular ivy leaves. Listening and hearing. Listening is calming as well as interesting, try to build in sounds that are natural and also some that can be activated like; water features and striking chimes, etc. into your sensory garden. Natural sounds are the sounds of leaves rustling in the wind, birds singing, water trickling and splashing and raindrops pitter-pattering on windows and roofs. Bring back childhood memories--Remember the sensation of feeling safe and dry when taking cover in a rainstorm? Feeling-and-touching. Think of the different textures you feel at home or in town and in the country, eg. Soft sand, cotton, rough surfaces, lichens, stonewall, bark, smooth pebbles, polished wood, leaves, flower petals, ridged textured concrete, backs of leaves, hairy animals, leaves such as Stachys, buds, grass, bumpy cobbles, twigs. Weight, light bark, heavy clay, etc. Temperature, sun-warmed water, cold shaded water; stone next to soil. Wet and dry, moist and dry soil and sand, freshly shed leaves and older dry ones. Contrasting densities, hard stone and soft moss. Lamb's ear with its soft leaves is good for kids to feel as are strawflower and Chinese lantern. Spiky grasses add texture too. Kids also like the feathery ferns and the feather-like blooms of Gayfeather and Liatris. Smelling and Scent. Scented plants are the first thing we think about in a sensory garden design, but there are other materials that have distinctive and interesting smells. I can think of pond water, wood shavings, autumn leaves, cut grass, wet soil, fresh hay, stone, leaves and compost heaps, the smell of a well-maintained compost heap can be nice and earthy. When you are choosing plants for your sensory garden designs, select plants for their different types of scent. Scents that fill the air and can be smelt without touching the plant, plants you need to get up close to and plants you will need to pinch or crush in your hand. 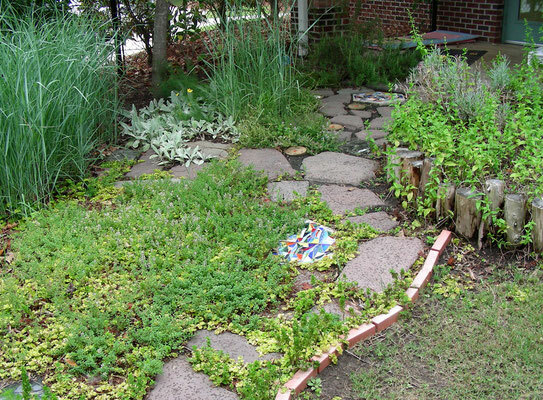 I have listed plants for sensory garden on this page sensory garden plants. Tasting. If children will be using or visiting the sensory garden, it makes sense to only include safe fruits and vegetables, I have listed a few fruits and vegetables on my sensory garden plants page. Mystery and surprise. Plan mystery into your design the "Ups and downs". The design and build of pathways is important in a sensory garden, a little bit of mystery, corners with high bushes or wooden structures blocking the view, width, changes in direction, branching, slopes, changes in textures, materials and colours are all important. plant fragrant plants along paths and entrances where they can be fully appreciated. Logs, trees, platforms, bridges, stages to stand on or climb up. Hanging baskets and mobiles set at different heights all add interest to a sensory garden. Colour. Flowers for the four seasons, leaves, bark, berries, lichens and mosses all add to the colour experience in your sensory garden. Shape. Leaves, sycamore, beech, ash, fruits and vegetables, apples, currants, rose hips and ornamental cabbage, flowers, daisy, poppy, and bell flowers. Stems, bamboo canes, etc. Planting containers, round, square, rectangular. Movement. For interest combine movement with sound. Aspen, willow, white poplar and grasses. Plant some within reach so that people can activate them. 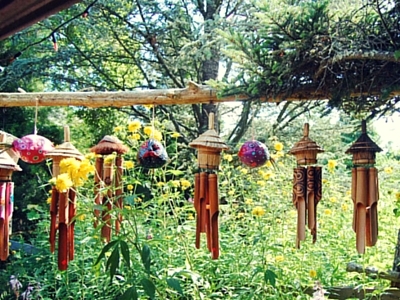 Place wind chimes in breezy spot. Contrast. Contrasting textures and surfaces like smooth paving onto cobbles, flowers, foliage. (Cotton to holly etc.). Texture. Feeling and touching rough surfaces, lichens, bark, smooth flower petals, ridged textured concrete, backs of leaves, hairy leaves such as Stachys, buds, grass, bumpy twigs, soft mosses, fungi, slimy algae, etc. Smelling/scent. There are many other materials other than flowers that have distinctive and interesting smells, wet stone, compost heap, etc. Choose flowers and plants that give off scents in different ways, scents that fill the air, plants you have to get up close to, plants you will have to pinch or crush in your hand, chamomile gives off a lovely apple fragrance when crushed under foot. See Chamomile lawn tips. Tasting. Stick to fruit and vegetables you know are safe if children are using the sensory garden unsupervised. Path design, The design of pathways is important in a sensory garden, a little bit of mystery, corners with high bushes or wooden structures blocking the view. Width, changes in direction, branching, slopes, changes in textures, materials and colours are all important. It's easier than you think to create a sensory garden at home and with a few changes a sensory garden can also be a good place for people with Alzheimer's and other dementia too. And something different in your sensory garden plan.